HELP RAISE AWARENESS ABOUT THE DIRTY TAR SANDS OIL THAT IS THE SOURCE FOR THE PROPOSED KEYSTONE PIPELINE. ORGANIZE A SCREENING OF WHITE WATER, BLACK GOLD! Most of the foreign oil imported to the U.S. comes from the Tar Sands of Northern Alberta, the source of oil that would flow across America in the proposed Keystone Pipeline. But this is not a traditional oil field. The oil must be extracted and processed from the sands at a significant environmental and public health cost -- requiring huge quantities of a diminishing fresh water supply and large amounts of energy that contribute to global warming. 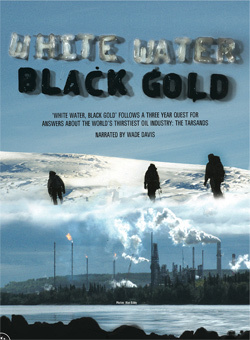 White Water, Black Gold follows Canadian adventurer and filmmaker David Lavallee on his three-year journey in search of the truth about the impact of the world's thirstiest and dirtiest oil industry. This is a journey of jarring contrasts, from the pristine mountain ice fields that are the source of the industry's water, to the Tar Sands tailing ponds, where thousands of migrating birds have unwittingly landed and died. In the course of his journey, Lavallee makes a number of discoveries that raise serious concerns for Canada and the United States. Native peoples living downstream are contracting unusual cancers; new science shows that water needed to process the oil will become increasingly scarce in an era of climate change; the proposed upgrading of the oilfields could endanger multiple river systems across Canada that makeup about half of its water supply; and planned oil pipelines across British Columbia and the US bring new threats to many precious ecosystems. White Water, Black Gold is a sobering look at the untold costs associated with developing this major oil deposit, and raises important questions about how much environmental damage we're willing to tolerate to feed our oil appetite. "Eye-opening... The contrast between formerly pristine waters and polluted waterways makes a convincing case for exploring sources of alternative fuels in this call for action." "Traces the paths of both an imaginary drop of water and drop of oil while investigating what threats the oil sands project may have on the third largest watershed in the world."